FRENCH REVOLUTION: The story of THE FRENCH REVOLUTION is an epic tale of political rebellion and economic upheaval. 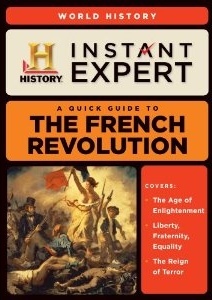 From the grandeur of Versailles and the marriage of Louis XVI and Marie Antoinette, to the disintegration of the revolution nearly a decade later, THE FRENCH REVOLUTION details this pivotal period in European history. BEN FRANKLIN: Narrated in a straightforward, conversational tone, BEN FRANKLIN features in-depth interviews with renowned biographers and historians, as well as on-location reenactments shot in high-definition, for a truly remarkable walk in this founding father’s footsteps. BEOWULF: The legend of Beowulf, the Viking world’s most famous warrior, is the ultimate tale of courage. Pit against thirsty invaders, barbaric monsters, and a fire-breathing dragon, BEOWULF emerged as Norse mythology’s greatest hero. THE MAYFLOWER: The epic saga of the pilgrims and their journey to and colonization of the New World is one of the fundamental narratives of our nation. THE MAYFLOWER explores the true story of the pilgrims and how the colony’s saga continued in the decades after their fateful voyage. EGYPT: Through cutting-edge digital graphics and interviews with noted Egyptologists, EGYPT explores the civilization’s awe-inspiring engineering accomplishments, chronicling the pharaohs and feats that helped build the world’s first superpower. THE STORY OF OIL: An energy source unrivaled in efficiency and power, oil is the driving force behind today’s industries and economies. THE STORY OF OIL traces the story of oil through the centuries, from its birth deep in the dinosaur-inhabited past to its ascendancy as an indispensable ingredient of modern life. Now A&E is kindly offering one of the readers of Versailles and more the entire series. Two of its installments, the French Revolution and Ben Franklin, should be of direct interest to 18th century enthusiasts. Giveaway Rules: Post a comment here, and become a blog subscriber (RSS or email) on or before August 24, 2010. Only United States addressees are eligible.